If you know of someone who has lost a beloved pet, you can show them you care and let them know you are thinking of them in a unique and meaningful way. 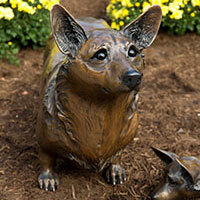 We offer several programs that provide pet owners and friends the flexibility in giving the most kindhearted tribute they desire. A program that allows veterinarians and individuals to do something meaningful for someone suffering the loss of a beloved pet. 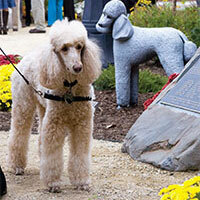 Read about the Dolores McCall Pet Tribute Garden, located near the entrance to the Purdue University College of Veterinary Medicine’s Small Animal Hospital, and how that it provides an opportunity for you to honor the human-animal bond and pay tribute to your animal companions with a permanent legacy. Click here to learn more about this program and download an inquiry form. Through the Purdue University College of Veterinary Medicine Peace of Mind program, you can assure yourself that your pet will continue to receive compassionate care if the pet outlives you. This program is designed to give pet owners the peace of mind that their pets will be cared for should they be orphaned. By including the program in your will, you can be assured that your pet(s) will be placed in a good home and that their medical expenses will be taken care of for their lifetime.